A true story—the boy in the cabin becomes a teenager. Written by Vaughan Durston, Founder of U.B. David & I'll B. Jonathan Inc.
After the decision to go to Bible College in the summer time it wasn't so hard leaving for school. My twin was going with me. It probably was harder on Mom than anyone else. We went to Briercrest Bible College which was 340 miles away. It was a trip we would take many times, usually by bus. The school was an old airport and there probably were over 300 students there. About 50% of them were girls. Our president advised first-year students to keep their noses in the books. Not a bad idea. No dating, but you could smile when you could not say a word. It was a new experience and an opportunity to meet and make life-long friends, with Christians seeking to study the Bible and asking the Lord what they should do with their lives. What did we learn at College? For Con and me it was a review of a lot of the things Mr. Campbell taught us in the cabin. Such as a bird's eye view of the Bible, how we know the Bible is true, and the walk of faith. Another interesting subject was coming events in prophecy. One year led to two, and that was an important year when I took my nose out of the books for a few minutes. I'll tell you about that in the next lesson. Soon we were in our last year and it was conference time in the fall. Dad had told us that we were going to need to make up our minds if we were going to farm or not. Often there was a world-famous speaker at these conferences and one of those was Major Ian Thomas of the Torch Bearers. He was speaking on Moses, only this was different than I had heard before. Major Thomas was saying that Moses lived to be 120 years old. He spent his first 40 years learning how to be a somebody and in Acts 7:21 it says, "he was learned in all the wisdom of the Egyptians." 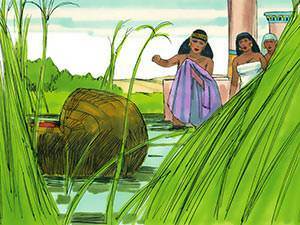 Remember he was taken from the bulrushes in Exodus chapter 2 and became Pharoah's daughter's son. Apparently he was given the best education. Further it says in Acts 7:21, "he was mighty in words and deeds." 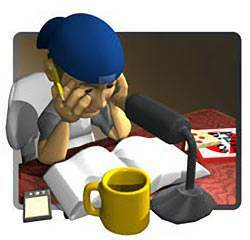 Thomas said it is one thing to be educated but it is another thing to know how to use it. Apparently, God wasn't through with his education. 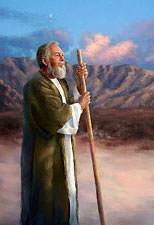 Moses killed an Egyptian when he was 40 years old and he had to flee for his life into the wilderness. "All we like sheep have gone astray; we have turned every one to his own way; and the LORD has laid on Him the iniquity of us all." Mr. Thomas said Moses spent 40 years learning how to be a nobody. Wow! Everybody likes to be a somebody. Who wants to be a nobody? Can you imagine Moses who used to sit on soft cushions in the palace now sitting on rocks in the hot desert. Did he feel sorry for himself? I'm sure he did. Could he leave? No he couldn't. Egypt was looking for him. Did he kick rocks and stub his toes? Probably. For forty years! Wow! God was watching him. Was he angry at God? It reminded me of picking rocks, feeling sorry for myself and wishing that I could quit. One day God began to talk to Moses and say, "You know, Moses, it is a nice day. The sun is shining and the birds are singing, and…and you are so miserable. If only we could get rid of you and your attitudes you could have a nice day." Finally, Moses agreed that God was right and asked God to get rid of him, his self pity and fill him with the fruit of the Spirit. Wow! "God if you want me to stay here the rest of my life with you, I will." 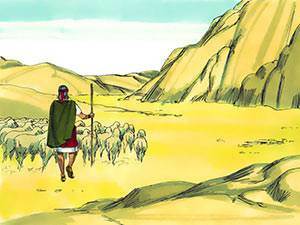 Soon after that Moses was looking after the sheep when he saw an amazing sight. A bush was on fire, but the bush was not destroyed. Wow! This was incredible. Did he watch it for an hour? "I think I will move a little closer," and he did. "Moses! Moses!" God spoke to him. "Get your shoes off. The ground on which you stand is HOLY!" Mr. Somebody had become Mr. Nobody, and God wanted to use him. Moses had been waiting for God and God had been waiting for Moses. Can you see the picture? Moses had now become so meek before God that later on it was said he was the meekest man on earth. He had excuses, and finally God asked him what he had in his hand and he replied, "a rod." God said, "Cast it down." 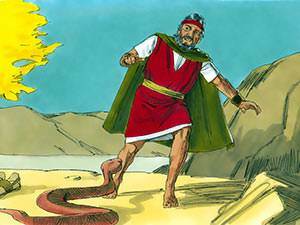 It immediately became a serpent and Moses fled from it. God said, "Pick it up again" and it became the Rod of God. God used it to glorify Himself in Moses' hand. Wow! Mr. Thomas said someone here has something in their hand and God may be asking for it. Give it to Him. The serpent in the Bible represents sin and if God wants something and you won't give it to Him there could be sin in it. Give it to Him. He will either take it away and you will wonder why in the world you were hanging onto that thing or He will give it to you again and it will become an instrument of blessing. I knew who God was talking to and what I had in my hand. It was the farm. Con had the same possibility. Deciding to leave home and go to Bible College was one thing but a final decision on the farm was another. We gave the farms to God. 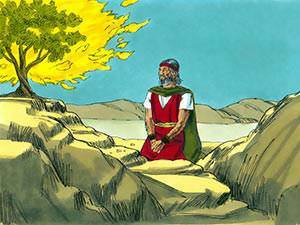 Moses made the right decision and we can read his amazing story of what God did. I'll tell you later of the amazing things God did as a result of a right decision. God is no man's debtor. By the way, in Moses' case Mr. Somebody became Mr. Nobody and then found out what God could do with a Nobody for the last 40 years of his life.